Costa del Sol is famous for its beautiful scenery, sandy beaches, and numerous historical landmarks. Last year, a shocking total of 12.5 million tourists from around the world came to visit the region. But, what is there to do after the sun goes down in Costa del Sol? You'll be up all night experiencing the wildly fun nightlife in Malaga of course. Malaga, Spain's nightlife begins late at night. Normally, Spaniards will head to the club around midnight--it's common that bars and clubs aren't even open until 11pm. When you order a drink at the bar or club, you don't have to worry about tipping. Expect to be clubbing until the wee hours of the day. Nightlife doesn't end until 6 or 7 in the morning. Malaga is a trendy city home to a variety of cocktail bars and nightclubs. When you're in Malaga, it's common to visit the cocktail bars near Calle Granada and Plaza Constituci?n following your evening meal. Around 1 or 2am, partygoers will begin to trickle into the nightclubs. Many Malaga nightclubs, such as Anden, will stay open until 6am, leaving you free to party all night long. 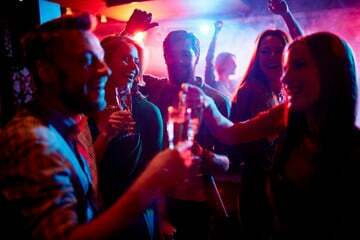 Visiting Torremolinos is a must if you're looking for a unique clubbing experience. Torremolinos has grown to be one of Costa del Sol's best party scenes. Not to mention that they have a variety of gay and lesbian nightclubs, like El Gato. Why not bring the club to the beach? Some nightclubs in Torremolinos are open-air, meaning they're right on the beach. If you're looking for a luxurious clubbing experience, head to Marbella. Not only does this city boast gorgeous resorts, beaches, and golf courses, but it's also home to a famous strip of nightclubs, known as the "Golden Mile." The Golden Mile stretches all the way to Puerto Banus - a stunning marina filled with yachts. Long gone are the days that Fuengirola was a subdued fishing village. Now, it's quite the party spot. Visit Fuengirola and you'll get to listen to live rock music, the blues, and even jazz bands. If live music isn't your thing, head to the clubs to dance all night. If you're visiting in late June, don't forget to head to the beach for San Juan's festival. You'll spot tons of people walking along Fuengirola's coastline, having bonfires, and partying it up. Benalmadena is the perfect destination if you're looking to listen to some live music, sing karaoke, or just go dancing at the club. Plaza Solymar, or the Plaza of Sun and Sea, is also located in Benalmadena. Nicknamed the "24-Hour Square," this plaza hosts plenty of bars and nightclubs to choose from. Thinking about spending a holiday in Spain? Definitely check out Costa del Sol's nightlife. You might be up all night and have a hangover the next day, but it's definitely worth it. Check out our blog for more tips on traveling in Spain.